« LONG ON FAITH, SHORT ON FACTS? If you’ve spent much time on this planet, then I’m pretty you’ve had the misfortune of encountering the kind of people described in this graphic. I certainly have. In fact, a close friend has just experienced that: her husband left her and, as a result, there are people at her church who are just as flawed as my friend, but were still self-righteous enough to turn their backs on her. Now, before we go any further, it’s time I came clean and declared I’m a hypocrite. There have been times when I’ve said one thing and done something entirely different (just check with my very patient and forgiving wife). 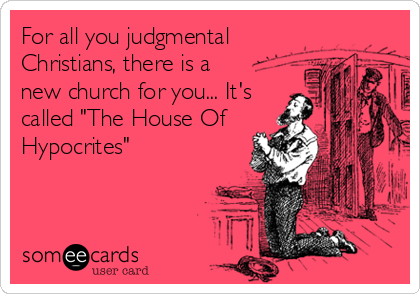 While I’m at it, I think it’s safe to write that every church on this planet can be called “The House of Hypocrites” because they’re all filled with people like me. Sometimes, without even realizing it until later, we grab our gavels, pound our desks and pompously declare others guilty of the very wrongs we’ve committed. Does that make church an ludicrious time-waster? Not at all. The key thing is to understand this: “The church is a hospital for sinners, not a museum for saints.” Those are the words of longtime newspaper advice columnist Abigail Van Buren (better known as ‘Dear Abby’) and they make absolute sense. I go to church because there, I can learn from other, more mature Christians how to identify and turn away from hypocritical behaviour and be the person God knows I can be. Because I’m judgmental, I go to church so I can learn the truth of my faith: the only person who can truly be judgmental is Jesus Christ (whom serious Christians, and many others, believe is the son of God). Serious Christians believe what the Bible says, that Christ never committed a single sin. That makes Him alone worthy of holding the gavel of judgement. Once I decided to believe that Jesus is God’s gift to me and I should accept that gift, God started the process of making me “right again”. He can do the same for you, too. Just accept His gift and see what happens next. You have echoed here, Frank, what our senior pastor has stated so many times – the church is filled with sinners and hypocrites. They are the very ones who need Jesus! Our pastor is also the one who freely admits that he is a sinner, too. He makes accepting Jesus as our Savior so inviting and genuine. We all miss the mark, yet our prayers daily can move us toward the mark our Lord wants us to make, even if it isn’t realized until we are in Heaven. Thanks once again for another wonderful, inspirational Saturday! Hope you will visit me at my two blogs: http://marthaorlando.blogspot.com and http://jordanorlando.blogspot.com. In my adult SS class we are going through the book of Matthew, and as the usual teacher was going to be out of town for Spring Break, I was asked to fill in for the week. Picking up where she left off, I led a very good discussion on the first half of Matthew 16, regarding “the leaven of the Pharisees” and hypocrisy. I wish I would have read this first, as I would have shared a few lines verbatim. One issue (while I believe it is somewhat intrinsic to humanity) that we considered as we strove to define hypocrisy is biased selectivity – that is, condemning an action in one person that you refuse to criticise in another (self or otherwise). In dealing with Christian congregations my entire life, I have noticed a direct and inverse relationship between how likely one is to commit a specific sin (adultery, drunkenness, etc) and how loudly they condemn it. In the case of the Pharisees, they would gladly condemn “working” (gathering food?) on the Sabbath, but there was a reason you never heard them condemn pride, bribery, or plotting to kill someone. One point that I wanted to add, from our discussion, is that talking to someone about a pitfall that you have fallen into in the past (or maybe even still struggle with) is not hypocrisy – it is experience. Who better to speak to someone on the matter? The important thing, as you say above, is the attitude with which we engage the other. Is it solidarity, or arrogance? Are you (even subliminally) excusing your own struggles while condemning those of another? As cheesy as it sounds, such “correction” must be done with love…and it’s very easy to tell the difference.